After my last post I figured it was time to bring in reinforcements. A number of Lotus guys recommended I get in touch with Jeremy Buckingham at Buckingham Automotive and have him take a look at the oil pan. The speedo, fuel gauge, and idle issue are all “non critical” in the sense that you can still drive the car, however, having oil in the engine is a bit of a prerequisite and had to get solved. At their suggestion, I got in touch with Jeremy and on a chilly October morning topped up the oil and took the Caterham up to Jeremy. Jeremy’s an ex-F1 mechanic with years of racing experience and access to a full machine shop – if he couldn’t get it fixed nobody could. Jeremy quickly reported back that the oil pan had a bit of a wave in it and some scoring marks so he re-machined the lip so it was flat and true then resealed it. After 72 hours he confirmed no leaking and the car was ready to go. He also poked around a bit with it to validate the build and gave it his stamp of approval. Having someone who used to do quality assurance on F1 race cars say you did a “great job on your build” (that’s a direct quote) is kind of like your kid getting accepted into MIT. Then the rain set in. For 2 weeks. Every. Single. Day. And each day I’d dream of actually going to get the car and driving it. Finally, on Friday, November 13th, about 12:30 in the afternoon it was a fabulous 65 degrees (F) and I was able to clear my work calendar enough to go pick it up. I then enjoyed an hour and a half blat during my lunch break to get the car from Jeremy’s shop to the house. The weather was perfect – you could smell the leaves in the fall air… right until I got behind a garbage truck for 3 miles. 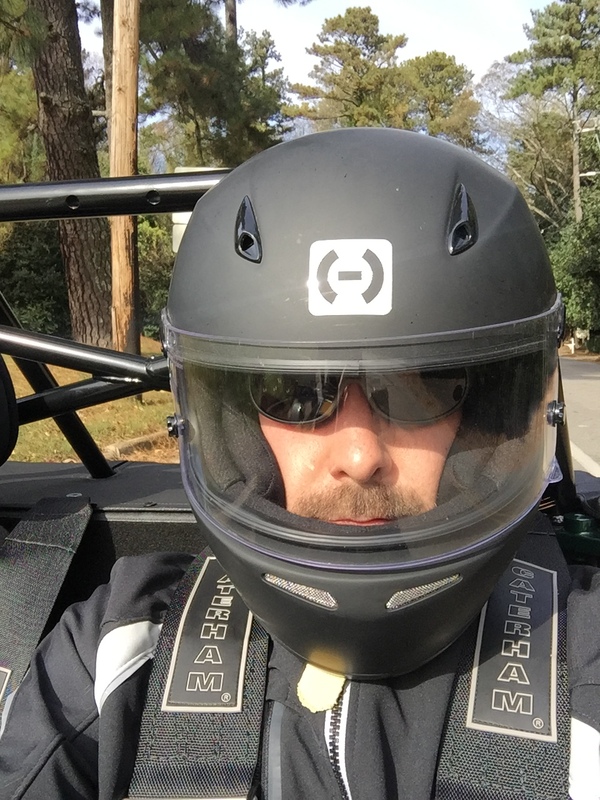 So in summary, the car is home, oil pan is fixed, and Jeremy is A-class – highly recommended for anyone in the Atlanta area who needs vintage race car prep or work on their Caterham or Lotus.